Constantly faced with our own mortality, decay and death become feared. What to expect after life is unknown and it is these fears which can restrict the way we live. Utilising watercolour, oil paint and acrylic in my work I portray themes such as decay and death in a positive light. I feel that we are able to have more understanding of life by tracking the process of decay. 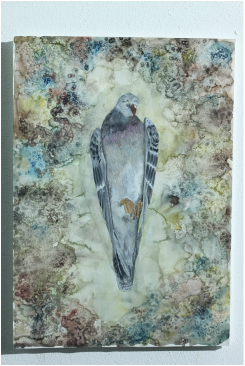 By observing dead birds over a period of time nature takes its course; it is important to me to portray accurate representations of my subject matters so to expose everything that decay withholds. Life is never truly lost, and the vessel that contains all that you are contributes to other life.